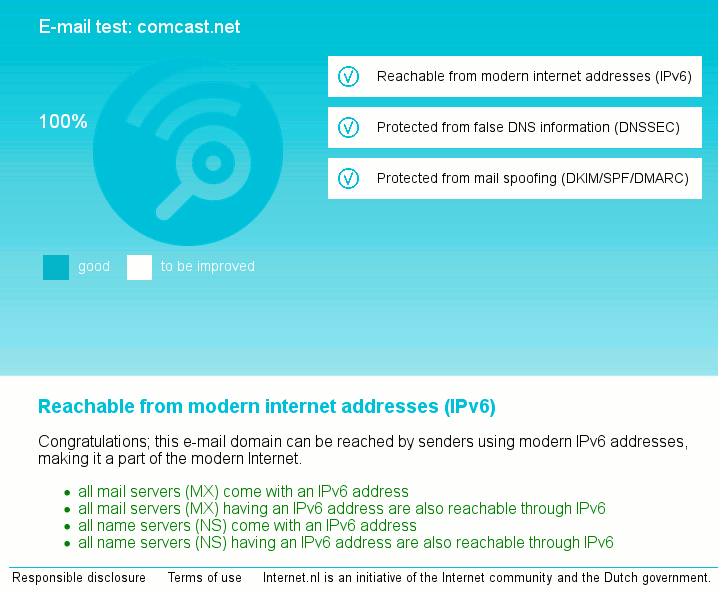 An initiative organized by the Dutch government, industry organizations, and the Internet Society is offering a website where users can see if their email provider is using a range of modern Internet standards: IPv6, DNSSEC, TLS, DKIM, DMARC, and SPF. Use this link in English or this link in Dutch to access the site, which includes definitions and background information about these standards. Screenshots for a domain that scores 100% shown below. The site will check websites or email services for the appropriate standards. To check one of these, just enter the address in the box for the service you’re interested in and hit the Enter or Return key. If you provide both, you’ll probably only get the check for the last box you filled in. If you click on the “To the detailed report” link you can see an explanation of some of the things being checked, color-coded for whether they passed or failed. It’s common for domains that have all three of the email authentication standards deployed to to get a “Not/partially reachable” result for the IPv6 checks because they haven’t yet deployed an IPv6 nameserver record, even if their mail and web servers are reachable via IPv6. The site still has some rough edges but this is a nice step forward in allowing end-users to see whether their mailbox providers have adopted these technologies. This entry was posted in Blog and tagged DKIM, DMARC, DNSSEC, Dutch, Holland, Internet Society, IPv6, Netherlands, SPF, testing, TLS. Bookmark the permalink.